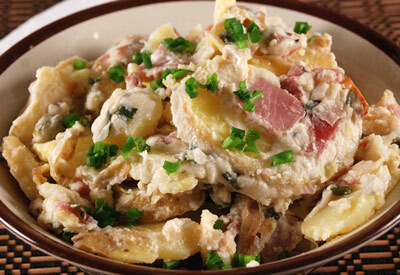 Add sliced potatoes to a large pot of boiling water and cook for 10 minutes. Drain potatoes and set aside. Melt butter in large skillet. Add ham and saute for 2 minutes. Add shallots and garlic and saute for 1 minute. Add flour and stir with a wire whisk until throughly incorporated. Add half and half, salt and pepper and stir until mixture begins to thicken. Remove from heat and fold in chives and cheese. Spray a 13 x 9- inch baking dish with nonstick spray. Cover the bottom of the dish with a layer of potatoes. Place half of the sauce over the potatoes. Repeat with the remaining potatoes and cover with the remaining sauce. Cover with foil and bake for 30 minutes. Increase temperature to 375 degrees F, remove foil and bake for an additional 15 minutes. Sprinkle top of casserole with freshly chopped chives if desired and serve piping hot.